When a tragic accident tore his life apart, Nick Deegan left his beautiful wife Kate and their two young children - always thinking that someday he would return to them. Now, two years later, Kate has passed away after an illness and Nick moves back home to raise Emma and little Liam without her. On the day of Kate's funeral, Nick discovers a book she left for him containing things she wanted him to know. But alongside the dos and don'ts of raising their children are details of five dates, with five very different women, Kate has arranged for Nick in the months ahead. As Nick navigates his way through the book and tries to cope with everyday life in Kate's absence, he slowly realises that it's not romance Kate wanted him to find, but something far more important. Will Nick find the courage to take a second chance? Things I Want You To Know touches on every emotion you can imagine. It made me laugh. It made me cry, it made me want to hug my children extra close. You definitely won’t want to put it down until you’ve read it through to the end. It has been two years since a dramatic series of events forced Kate to kick her husband Nick out of their home in the hopes he can repair the shattered pieces that have become his life. Unfortunately before he can do that and return home to his family, Kate passes away after a lengthy illness and Nick must now return home to care for their two young children who are traumatized by her death, especially his daughter Emma. 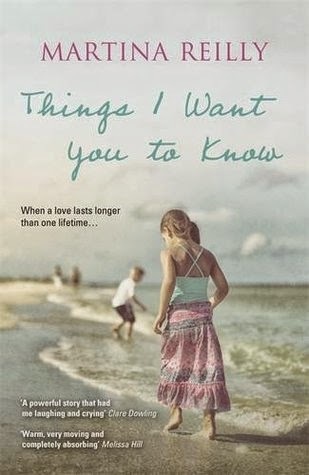 Struggling with his guilt and loss, Nick finds a video from Kate and also a book that outlines ‘’things she wants him to know”. It also outlines dates that Kate has set up for Nick, each with a very different women, only these are not dates set up with romance in mind, rather they are dates intended to help Nick find himself again by examining his past and the love he and Kate shared. Her intention was to gently push Nick into a new part of his life. Without giving anything away... will Nick manage to overcome his guilt, grief and hatred of Kates best friend and put his family back together? I was drawn into this novel whole-heartedly! Thank you to Hachette Books Ireland for our review copy. All opinions are our own.